Soft fatty tissue found in the centre of bones; it is served mainly with roast beef and cardons and can also be used to add flavor to soups. Designates the tender, delicately flavored thymus gland of calves, lambs and kids; veal sweetbreads are especially prized. 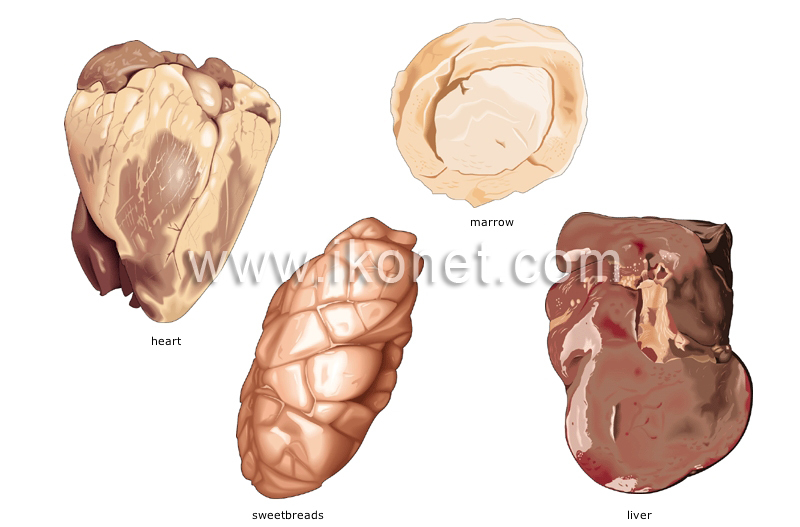 People eat the liver of slaughter animals, poultry, game and some fish (cod); it has a high iron content. Cooked in ragouts and casseroles, it can also be sautéed, roasted, braised or simmered; veal, lamb and chicken heart are the most popular.